A story of "Kangaroo of Mathematics"
In the early 80's, Peter O'Halloran a math teacher at Sydney, invented a new kind of game in Australian schools: a multiple choice questionnaire, corrected by computer, which meant that thousands of pupils could participate at the same time. It was a tremendous success for the Australian Mathematical National Contest. In 1991, two French teachers (André Deledicq et Jean Pierre Boudine) decided to start the competition in France under the name "Kangaroo" to pay tribute to their Australian friends. In the first edition, 120 000 juniors took part. Ever since the competition has been opened to pupils as well as to senior students, followed by 21 European countries forming altogether "Kangaroo without borders". In June 1993 the Board of the French Kangourou has convened a European meeting in Paris. Were also invited many of organizers of mathematical competitions in European countries who were impressed by the steadily increasing number of participants in the French Kangourou competition (120 000 in1991, 300 000 in 1992, 500 000 in 1993) were invited. Seven countries decided to adopt that same scheme: Belaruss, Hungary, The Netherlands, Poland, Romania, Russia and Spain. It has been a great success in all countries in May 1994. In June 1994, in Strasbourg, at the European Council, The General Assembly of the delegates of 10 European countries decided the creation of the "Kangaroo without Frontiers" Association with an elected Board of 6 members and with legal Statutes registered in Paris, on January 17th 1995. At the beginning of this globalisation initiative, France gave technical and financial help until the meetings in Paris (January 1995) and Eindhoven-Netherlands (December 1995). In Eindhoven (December 1995) the competition was common (identical) in all countries at the "Cadet level" (13 - 14 years old); same contest technique (multiple choice questions), same day of contest, same time-table, same prize for every participant". Every country has its own organization and its own prices and no comparison of results has been made between countries. Starting in 1996, all country-members participated in the practical organization of the Annual General Assembly at a level proportional to their number of participants. In Torun-Poland (November 1996) it is decided that all competition subjects at all levels would be the same in all country-members. In Budapest (October 1997), the 21 countries who were present adopted the final regulation defining precisely the financial participation and the rules to be followed by any countries wanting to become members. Since 1995, the Association's annual General Assembly takes place in a different country, in October or November. The subjects of the following year's contest are chosen. The documents and prizes are exchanged, the inter countries summer camps are scheduled and programmed. Days of Paris in 2003: received by the Lord Mayor in Paris City Hall, the delegates members of Kangourou Sans Frontières are welcomed by the doyen of General Inspection for Mathematics, on behalf of National Education Minister, who was supporting this event. Every Summer, a thousand of contest winners, get together in captivating meeting-holidays, either in Carpates, or visiting the Loire Castles, or along the coasts of Mer Noire or Balaton Lake. Not to be dissociated from its publications, Kangourou has been given in 1994, the D'Alembert Prize, by the Mathematical French Society, for the best work of Mathematics generalization and diffusion. Besides, the Kangourou has been distinguished for its important contribution to mathematics pedagogy, during the International Symposium for Mathematics teaching, held in Copenhagen in July 2004. For this occasion, André Deledicq received the ERDÖS Prize, given each two years, by the World Federation of National Mathematics Competitions. 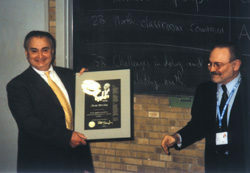 André Deledicq receiving his award from Professor Hyman Bass, Président of CIEM, in Copenhagen on July 6, 2004.